Hungry Girl Magazine: New Issue Coming in December! It’s official! A brand-new edition of Hungry Girl magazine will be hitting stores everywhere in late December. Stay tuned for updates, including how you can get it delivered straight to your doorstep with NO additional shipping cost! Digital copies of previous issues are still available! You can order the Spring and Summer issues from Barnes & Noble and access it via your Nook tablet or the free Nook app (which works on tons of devices)! Or you can order the Spring and Summer issues from Zinio! Summer Issue: Click here to download the Freestyle™ SmartPoints® values* for the recipes in the Summer 2018 issue of Hungry Girl magazine... the one with the sandwich on the cover! 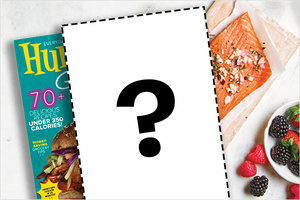 Spring Issue: Click here to download the Freestyle™ SmartPoints® values* for the recipes in the Spring 2018 issue of Hungry Girl magazine... the one with the mug recipes on the cover!